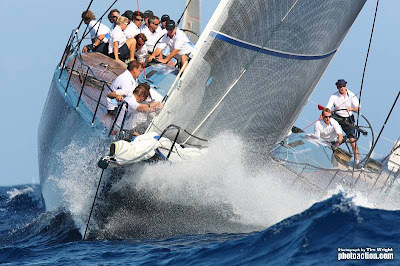 March 7, 2010, Simpson Bay, St. Maarten – there can be few events in the world that match St. Maarten Heineken Regatta’s unique cocktail of fun and serious racing. Under the leadership of Robbie Ferron – Sint Maarten Yacht Club commodore – who set up the regatta 30 years ago, this Caribbean classic continues to go from strength to strength and, if the positive buzz on the street is anything to go by, next year’s event is going to reach record levels. With some of the world’s most talented sailors including the likes of America’s Cup legends Peter Isler, Peter Holmberg, Gavin Brady, round the world sailors Kenny Read, Wouter Verbraak, Olympic/America’s Cup skipper Andy Beadsworth, and Dutch double Europe Olympic silver medallist Margriet Matthijsse, among the many high profile sailors competing here this week, it’s not surprising this event is fast becoming a Mecca for seriously fun winter racing. As well as the big names racing on the latest, powerful ultra-light racing machines such as Irvine Laidlaw’s Wally 82 Highland Fling, Tom and Dotty Hill’s brand-new stunning-looking custom Reichel/Pugh 75, Titan 15, George David’s Reichel/Pugh 90 Rambler, and a healthy mix of big Swans, Farrs and custom builds, yachts in the 30ft-40ft range make up the majority of the fleet including a bumper 99-strong Bareboat charter fleet. While fun and partying contribute hugely to Caribbean regatta success, it’s what happens behind the scenes and on the water that really counts. St. Maarten Heineken Regatta race team run a good balance of coastal and round-the buoys races, and offer a highly efficient results system, which are the other key factors that make a good event, great. The final race of the three-day St. Maarten Heineken Regatta this morning may have lacked one special Caribbean ingredient – sun – but there was certainly no shortage of action for the 240-boat fleet in the extremely lively northerly breeze which allowed the big raunchy yachts the opportunity to really strut their stuff on the 27nm race from Marigot Bay back to Sint Maarten Yacht Club. Hans-Joachim Tiggels and team from Germany sailing a Beneteau Oceanis 523 Acele et were the overall winners of Bareboat 1, with the Duketown Official Royal Sailing Team (DORST) finishing second. Ronald Gessel and team in a Harmony 52 Neerlands Glorie who was leading the fleet going into today’s final race, suffered a disqualification following a protest hearing and had to settle for third overall. After a relaxing afternoon at Sint Maarten Yacht Club, and at the big prizegiving event, competitors and guests were treated to a relaxing evening dancing the night away on the beach in the presence of International Reggae superstar Maxi Priest and his band who played classic hits of the last three decades, well into the early hours, concluding yet another successful St. Maarten Heineken Regatta. For full information on the Gill Commodore’s Cup, Budget Marine Match Racing, and the St. Maarten Heineken Regatta, including entry lists, entry forms and news, visit www.heinekenregatta.com.